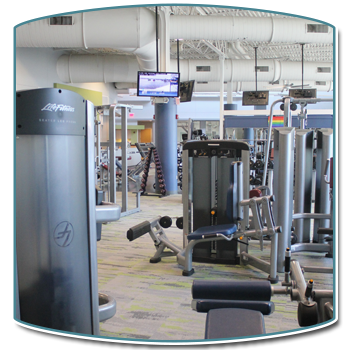 Powell Wellness Center (PWC) features a central fitness area with strength and cardiovascular equipment, a large group exercise classroom, cycling studio, aquatic arena, stretching area, indoor walking track, café, pro shop, locker rooms and child care. We offer ample parking that includes accessible and van-accessible parking. We are conveniently located at the corner of Business 29 and Golf Drive in Culpeper, VA. Check out these short video clips to see what PWC has to offer! Our exercise area is designed to provide each member with a safe and functional workout experience. Exercise specialists are available during all operating hours to help members exercise safely and effectively. 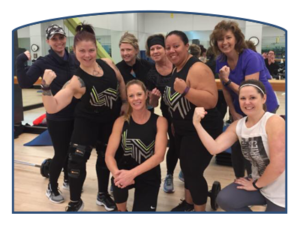 The cardiovascular area offers various equipment including treadmills, ellipticals, upright and recumbent bikes, stair climbers, and rowers for a variety of cardiovascular and functional exercises. For entertainment, the floor has eight televisions and four XM music stations. The strength area offers a variety of exercise equipment for functional exercises that help strengthen muscles, improve balance, and enhance flexibility. Our group exercise room features a suspended wooden floor to minimize stress on the joints. The room is used for group exercise classes like yoga, aerobics, Zumba, and Pilates. A separate indoor cycling room is equipped with stationary bikes for cycling classes. The stretching area provides space for members to stretch each major muscle group in three different movements. Mats and floor areas are also available to perform stretches and complete the workout experience. Our climate-controlled walking track includes a two-lane surface with a cushioned rubberized floor. The track is 1/18 mile long with 18 laps covering one mile. Bring your friends and go for a walk! The Aquatic Arena features a therapeutic, unique, rehabilitation, two-temperature lap and exercise (TURTTLE) pool to fully serve our members’ needs and interests. The TURTTLE includes a warm-water pool, two warm-water pockets for therapy, a two-lane walking oval with chest-high water and a current, and lap lanes for swimming or aqua classes. Water exercise is great for arthritis, balance, low-back pain, and low endurance. In addition, the Aquatic Arena includes a hot tub and a steam room that are designed to help with functionality concerns, stiff joints, and removing toxins from the body through perspiration. Read about aquatic programming, which includes swim lessons and family swim times. Child care services are available for children ages 6 weeks to 12 years, allowing you to focus on getting in a great workout, knowing your children are in capable hands. In Kids’ Corner, our trained child care staff supervise and entertain children by playing board games and cards, doing puzzles, and coloring, or playing in the adjacent outdoor play area.